A memorandum of understanding (cooperation protocol) between the Ministry of Social Solidarity and Professional Development Foundation was signed on the 27th of October 2014 for the implementation of distinctive training programs presented by PDF. PDF will offer its services in two categories, Building the institutional capacity of the NGOs nominated by the Ministry of social Solidarity and a training program designed to develop the ministry’s employees’ skills to increase their capabilities in facing & overcoming their work challenges. PDF, the first Institute of Leadership and Management - ILM Recognized Provider in Egypt! Professional Development Foundation “PDF” is now approved as the first ILM Recognized Provider in Egypt! PDF is approved to deliver Maharaty and Workforce Passport inside Egypt as an ILM internationally accredited Programs & certification. The Civil Society Support Center is pleased to announce starting the registration and accepting the NGOs nominations in the NGOs Capacity Building program that is offered by Professional Development Foundation, The program will be held in Cairo in mid-September 2014. The NGOs Capacity Building program is offered as a scholarship for NGOs, it focuses on the organizational capacity building, development of expertise and strengthen the organizations’ administrative capabilities to enable them to work better to achieve their goals. The program targets decision-makers, senior management & middle management. In case your organization is willing to join the program, please provide us with your nominations knowing that each organization can send up to four members allocated on the three program categories (decision makers, senior management & middle management), each candidate should fill a separate registration form. On July 24th, 2014 Professional Development Foundation – PDF invited its NGOs Capacity Building certified Cairo NGOs for a gathering Iftar, all the attended NGOs showed their interests in refreshing the cooperation as well as meeting other certified NGOs in the event to open cooperation channels within the network. During the day, PDF seized the opportunity to announce the launching of its NGOs Portal. PDF took all the invited NGOs in a walkthrough across the whole portal and how they can benefit from it. CSSC team explained all the portal services for the attendees, it showed all NGOs how to register their organizations on the portal as well as how to test all its features & services. PDF encouraged all NGOs to share any available data and content that can be useful for the civil society organizations on the portal in order to serve a bigger number of NGOs. Also it encouraged those who don’t have online websites to use the free websites templates that are available on the portal to create their own. PDF agreed with the attended NGOs on circulating the NGOs Portal link within their networks. The Iftar gathered a diversity of NGOs specialized in Women Development, Human Resources Development, Education and Health. The event took place engaging 24 participants representing 22 NGOs. 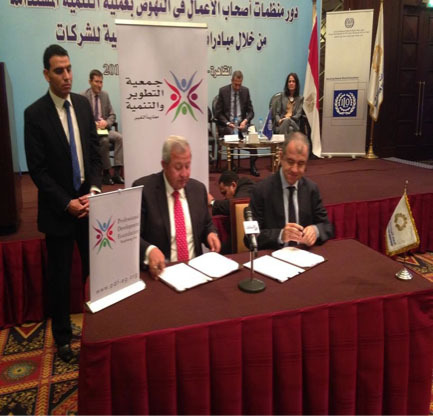 Professional Development Foundation (PDF) and Federation of Egyptian Industries (FEI) Sign a MOU to train FEI employees. Out of PDF strong belief in HR Development, Mr. Mohamed Farouk Hafeez, Chairman of The Professional Development Foundation (PDF) and Eng. Mohamed El Sewidy Chairman of The Federation of Egyptian Industries (FEI) signed a Memorandum of Understanding (MOU), on the 29th of April 2014. According to the agreement terms, PDF will train FEI employees in order to develop Egypt’s labor force and develop employees’ different business skills needed in different business sectors.